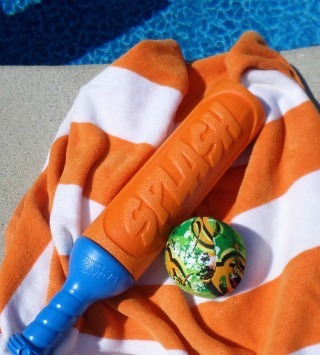 These cool pool toys will keep you, your kids and your friends entertained and in the pool all day. 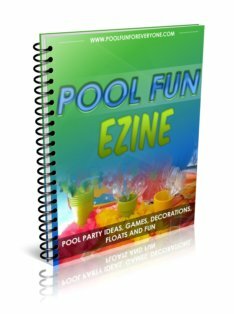 Whether it's a new pool float or a game that sends you to the bottom of the pool, give your pool some new excitement with some of these ideas. 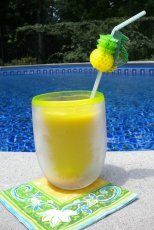 Pool floats and toys need to be geared to the age and swimming ability of those using them. They need to be durable and last for at least one swimming season. 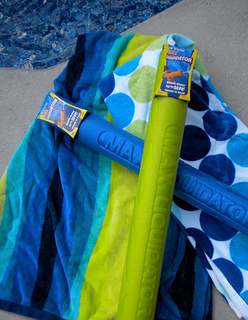 This foam bat and splash ball offers lots of opportunity for fun and for kids to come up with their own games. I got several extra splash balls to keep the peace. This velcro ball and catch game has been lots of fun for kids. We purchased two sets. It is a fun game for just about all ages if they can throw a ball. The velcro mit makes it easy to catch. We found ours at Target. The one we got from Target still works, but some of the velcro has come apart from the ball - however, it still works just fine. 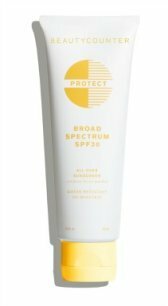 Amazon sells a different brand but with the same idea. This is a fun pool party game for boys and girls. 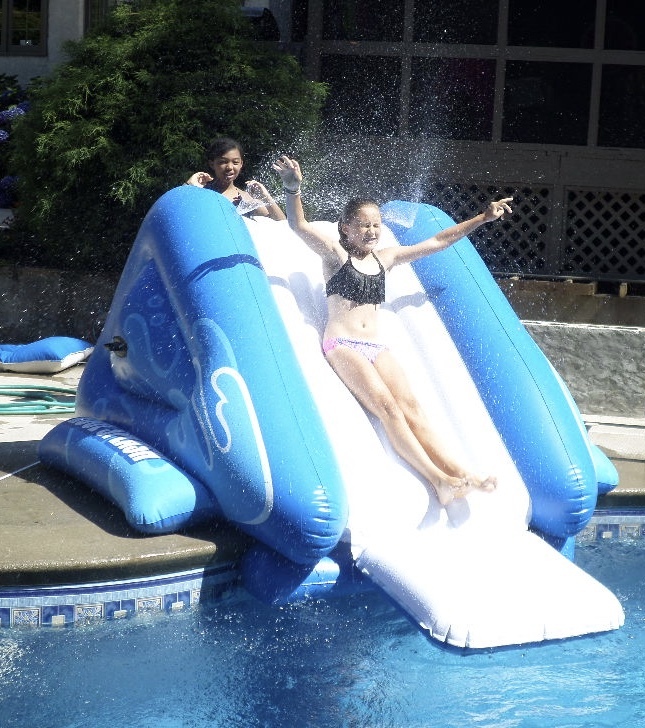 Our pool is attracting lots of visitors lately thanks to this cool inflatable pool slide. From 3 year olds to 13 year olds the slide is a big hit. Two sprinklers on the top attached to a hose keep the vinyl wet and slippery. Steps and grab handles in the back make it easy to climb. Put it in the deep end for big kids and the shallow end for the little ones. 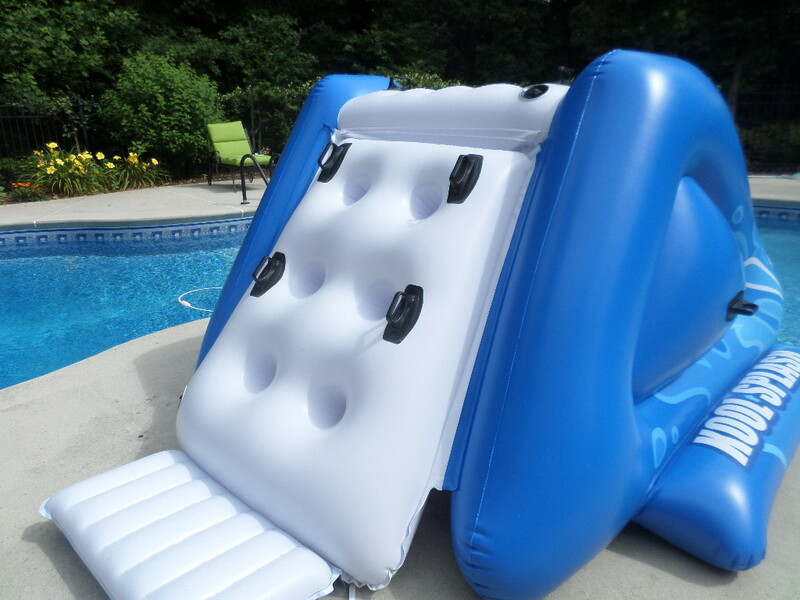 We use a portable air pump out by the pool and inflated very quickly. So far it's staying inflated and family and friends want to know when they can come back. Before inflating the pool slide determine where you want to place it so you're not dragging it across the cement and causing any leaks. Don't over-inflate - you can tell if it's over-inflated if you see that the seams are pulling or strained. These powerful, supersized squirt guns, are a fun addition to any pool for kids, teens and adults. Just hold the toy under water, pull the plunger out, and you have a squirt gun on steroids. Easy to reload and they shoot a long distance - maybe 25'. Kids can play with them (you will need more than one) and make up their own games or use them for organized games like Squirt Gun Tag. Whoever gets hit with a Max Liquidator squirt is frozen. The last one left is the winner. Use them to squirt a beach ball to the other side of the pool or have a target for kids to hit or see how many empty pop cans a player can topple over. 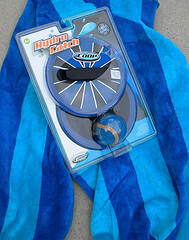 The Waboba Ball is a fun ball game to play at the pool, the lake or the beach. It is a soft rubber ball that bounces on the water. The key is you need to stand far apart - at least 35' to 40' in waist deep water. Throw the ball like you would a frisbee or skipping a stone. It takes a couple of times to get the hang of it. Try throwing it at different angles to see how high you can bounce it. To use it for a game there needs to be at least 2 people on each team. One team member tries to throw a pass to his team member while someone from the opposing team tries to block or catch it. If the the pass is blocked no point - but if the pass is caught the original team get a point. 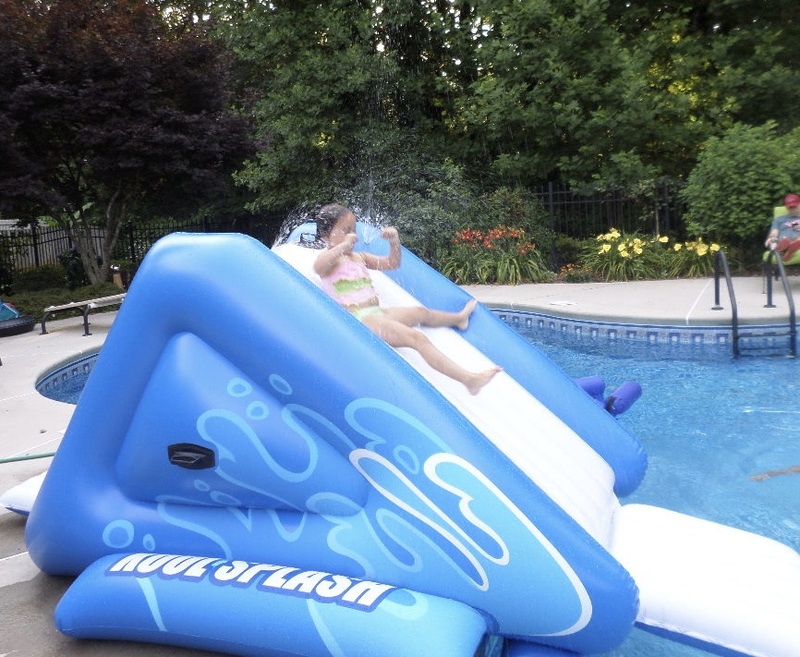 Inflatable pool games, like this one, will bring new "life" to your pool. It's a small investment to keep the kids entertained. The reviews on this inflatable pool toy found that kids 9 years and older had the most success and fun. The biggest complaint, but also what others found as positive, was that it was quite a challenge to figure out how to stay on the toy. Those that didn't give up and learned how to stay on it found it the most fun. There are some very innovative swimming pool inflatable toys like this Curly Serpent. It seems that either kids loved this toy or found it totally boring. Whether your kids will find this fun looking serpent entertaining is hard to predict. Swimming pool games to play with this fun looking serpent might just need a little imagination. It would be a great toy or prop for your Under the Sea game, Mermaid game or Pirate Party game. The kids pool toys that are the biggest hit are the ones that are appropriate for the age and swimming ability of the child. 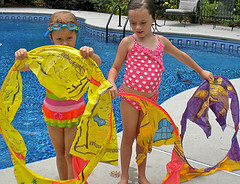 The "big hit" at our swimming pool this summer is this cool pool toy - Finding Nemo Spring Hoops . I purchased these hoops from Target last year. Our 5 year old granddaughter loves swimming through the hoops in search of "treasures" that are on the bottom of the "sea floor." 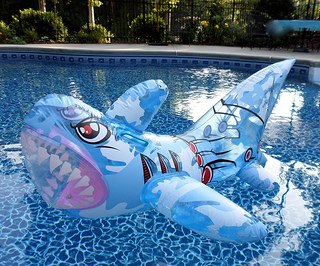 Your kids will love to spend more time in the pool with some fun pool floats - from flamingos to sharks, there's a float for every age and interest.